Yesterday after a great lunch in Philadelphia with an old friend I came home just needing to get out to the fields of Valley Forge. I was looking for the coyotes but also had my macro lens in case of a good bug. I found the crane fly, a very interesting but difficult insect to photograph. 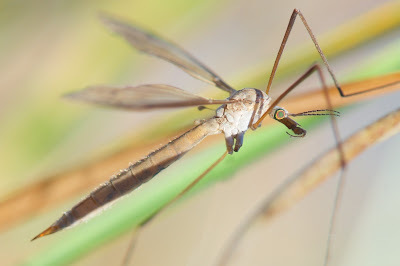 The crane fly looks like a huge mosquito with long, long legs and wings often wide open and a really long snout and beautiful psychedelic eye if the light hits it correctly. They are all over the fields these days, but I have such trouble getting them fully in the frame. So I found one yesterday low in the grass. The only way to get him was to lay down deep in the weeds and shoot up. As I was doing this, I first scared a runner who was running in the middle of the field and almost stepped on me. Then another man walked by and was totally startled when I stood up. I think I must have looked a little frightening, so I tried to calm him down by acting like a normal human being and just said I was taking pictures of insects. His gruff response, "I guess there is a lid for every pot." Oh dear.